In mammals, L-threonine is an indispensable amino acid. The conversion of L-threonine to glycine occurs through a two-step biochemical pathway involving the enzymes L-threonine 3-dehydrogenase and 2-amino-3-ketobutyrate coenzyme A ligase. The L-threonine 3-dehydrogenase enzyme has been purified and characterised, but the L-threonine 3-dehydrogenase gene has not previously been identified in mammals. Transcripts for L-threonine 3-dehydrogenase from both the mouse and pig are reported. The ORFs of both L-threonine dehydrogenase cDNAs encode proteins of 373 residues (41.5 kDa) and they share 80% identity. The mouse gene is located on chromosome 14, band C. The amino-terminal regions of these proteins have characteristics of a mitochondrial targeting sequence and are related to the UDP-galactose 4-epimerases, with both enzyme families having an amino-terminal NAD+ binding domain. That these cDNAs encode threonine dehydrogenases was shown, previously, by tiling 13 tryptic peptide sequences, obtained from purified L-threonine dehydrogenase isolated from porcine liver mitochondria, on to the pig ORF. These eukaryotic L-threonine dehydrogenases also have significant similarity with the prokaryote L-threonine dehydrogenase amino-terminus peptide sequence of the bacterium, Clostridium sticklandii. In murine tissues, the expression of both L-threonine dehydrogenase and 2-amino-3-ketobutyrate coenzyme A ligase mRNAs were highest in the liver and were also present in brain, heart, kidney, liver, lung, skeletal muscle, spleen and testis. The first cloning of transcripts for L-threonine dehydrogenase from eukaryotic organisms are reported. However, they do not have any significant sequence homology to the well-characterised Escherichia coli L-threonine dehydrogenase. In husbanded animals, dietary supplements of mixtures of indispensable amino acids regulate their growth and the activity of amino acid metabolising enzymes [1, 2]. The liver plays a critical role in regulating amino acid metabolism. Porcine-derived hepatocytes are being used in clinical studies of bioartificial liver organs . The regulation of amino acid supply to bioartificial organs and maintaining the activity of the amino acid-metabolising enzymes will be important in their development. From a metabolic perspective, threonine is one of three indispensable amino acids. In biological tissues, there are two major and one minor L-threonine degradation pathways. L-threonine is either catabolised by L-threonine 3-dehydrogenase (EC 1.1.1.103; gene abbreviation TDH) to 2-amino-3-ketobutyrate or by L-serine/threonine dehydratase (EC 4.2.1.16; L-threonine deaminase, gene abbreviation SDH) to NH4+ and 2-ketobutyrate in the major pathways and by threonine aldolase (EC 4.1.2.5; gene abbreviation GLY1) to yield glycine and acetaldehyde in the minor pathway [4–7]. In both prokaryotic and eukaryotic cells, the conversion of L-threonine via 2-amino-3-ketobutyrate to glycine takes place in a two-step process [4, 8]. L-threonine dehydrogenase catalyses the reaction: L-threonine + NAD+ = 2-amino-3-ketobutyrate + NADH. The subsequent reaction between 2-amino-3-ketobutyrate and coenzyme A to form glycine and acetyl-CoA is catalysed by 2-amino-3-ketobutyrate coenzyme A ligase (EC 2.3.1.29; gene name KBL). If not processed by 2-amino-3-ketobutyrate coenzyme A ligase, the highly reactive intermediate, 2-amino-3-ketobutyrate, rapidly undergoes decarboxylation to form aminoacetone and CO2. L-threonine dehydrogenase and 2-amino-3-ketobutyrate coenzyme A ligase have been found to be associated physically on the inner membrane-matrix of mitochondria where the two enzymes form a complex with a stoichiometry of one threonine dehydrogenase tetramer to two 2-amino-3-ketobutyrate coenzyme A ligase dimers [5, 9, 10]. The three-dimensional structure of Escherichia coli 2-amino-3-ketobutyrate coenzyme A ligase has been determined recently . Recently, we have cloned the murine and human 2-amino-3-ketobutyrate coenzyme A ligase cDNAs  and wished to clone the first enzyme in this L-threonine catabolic pathway. The E. coli L-threonine dehydrogenase gene and its activity have been well characterised [8, 13]. I describe the first isolation of eukaryotic cDNA sequences encoding L-threonine dehydrogenases that have significant identity to 13 peptide sequences from the purified porcine L-threonine dehydrogenase enzyme , and the amino-terminus peptide of L-threonine dehydrogenase from the Gram+ Firmicutes bacteria, Clostridium sticklandii . However, they have no significant homology to the E. coli enzyme at the primary amino acid sequence level. Previously we identified, by homology to the E. coli gene, both the mouse and human cDNAs for 2-amino-3-ketobutyrate coenzyme A ligase, the second enzyme in the biochemical pathway that converts L-threonine to glycine . In a search for the mouse cDNA of L-threonine dehydrogenase, which is the first enzyme in this pathway, I initially used the same approach. 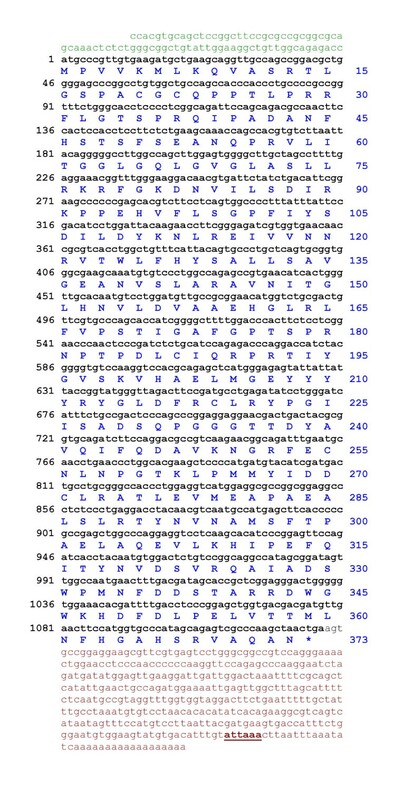 However, only expressed sequence tags belonging to sorbital dehydrogenase (and, with a much lower degree of homology, numerous isoforms of alcohol dehydrogenase) were identified. Nor were other candidate genes found in the human genomic sequence. Fortunately, Kao and Davis (1994)  had previously purified and characterised the porcine L-threonine dehydrogenase protein, that they had isolated from liver mitochondria and partially peptide, sequenced. This peptide sequence was used to identify mouse ESTs with significant homology by a back translation to nucleotides search. The program ESTblast  was used to construct a tentative mouse contiguous sequence from EST sequences. PCR primers were designed to match the 5' and 3' ends of the electronic contiguous sequence and used to amplify the gene from mouse liver and lung cDNA. After agarose gel electrophoresis, each primer set produced a single amplicon indicating that the gene is not alternatively spliced. The PCR products were cloned and sequenced. A blast search with the murine threonine dehydrogenase cDNA sequence of the pig EST database identified similar 5' and 3' ESTs (accession Nos. BE233801 and BI400146 respectively) and the sequence of these ESTs was utilised to design primers to amplify the pig L-threonine dehydrogenase from hepatocytes by RT-PCR. 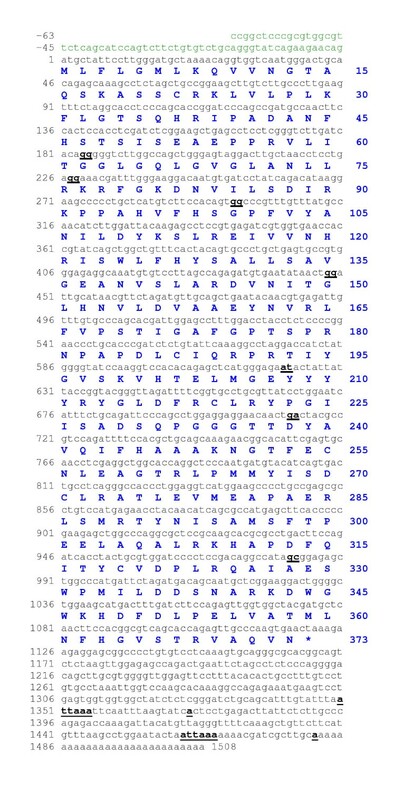 The 1508 bp mouse sequence has an ORF which encodes a 373 residue protein and has a ATTAAA polyadenylation signal at 1460–1465 (GenBank accession No. AY116662) (Fig. 1). A second clone (accession No. AF134346) includes 63 bp of 5'UTR and utilises a more 5' ATTAAA polyadenylation signal at 1350–1355. The predicted protein has a 41,461 Da molecular mass and an isoelectric point 8.45. The mouse genomic sequence for this cDNA is located on chromosome 14, band C (accession No. NW_000100, The Sanger Institute, UK). The gene spans 16.4 kb and consists of 9 exons. There is a 329 bp CpG island (64% CG) spanning the 5' untranslated exon (Fig. 2). 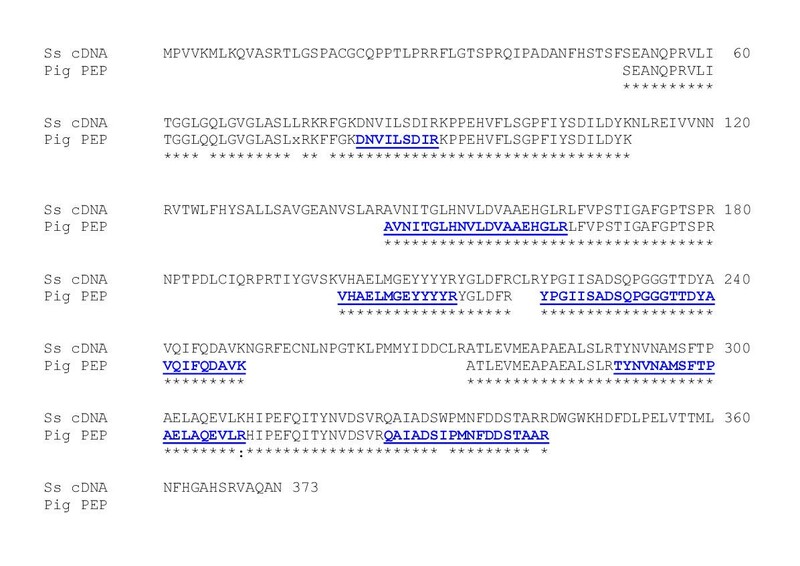 The cDNA sequence and translation of murine L-threonine dehydrogenase. There are two potential polyadenylation signals (attaaa at 1350–1355 and 1460–1465) shown in bold and underlined with the polyadenylation sites indicated by a. An * indicates the taa stop codon. The bold type and underlined nucleotide pairs indicate the positions of the exon/exon/ boundaries. The gene structure of the murine TDH gene. The gene spans 16.4 kb and consists of 8 translated exons and a 5' untranslated exon on chromosome 14, band C (supercontig accession No. NW_000100, The Sanger Institute, UK). 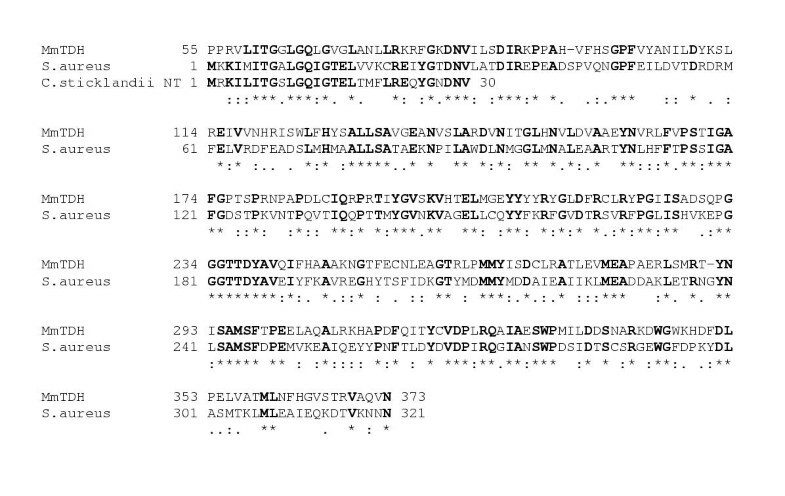 There is a CpG island spanning the 5' untranslated exon. The ORF is indicated by closed boxes and the sizes, in bp, of the exons and introns are indicated. The pig sequence (GenBank accession No. AY095535) also has an ORF that encodes a 373-residue protein with a 41,432 Da molecular mass and an isoelectric point 7.67 (Fig. 3). At the nucleotide level, the porcine and mouse ORFs have 78% identity and at the protein level have 81% identity and 94% similarity. The potential polyadenylation signal on the pig sequence is homologous to the most 5' signal on the mouse sequence. The porcine L-threonine dehydrogenase cDNA sequence and translation. The ORF (accession No. AY095535) is shown in bold and the 5' EST (accession No. BE233801) and the 3' EST (accession No. BI400146) are shown in lower case. The potential polyadenylation signal (attaaa) is shown in bold and underlined. Evidence that the porcine cDNA encodes for L-threonine dehydrogenase comes from the high degree of similarity to sequenced peptides from the purified and structurally characterised porcine L-threonine dehydrogenase protein isolated from liver mitochondria . The sequences of 13 porcine peptides have been aligned with the porcine ORF protein and have 98% identity over 212 residues (Fig. 4). The 5 mismatched residues are probably due to errors in peptide sequencing since they are located towards the end of the sequences. Comparison of the translation of the porcine L-threonine dehydrogenase cDNA and sequenced peptides from porcine L-threonine dehydrogenase. Porcine cDNA sequence, Ss cDNA; porcine sequenced peptides (Pig PEP). Individual pig peptides are alternatively, not underlined, then underlined and shown in bold. Conserved residues are shown by an (*) and strongly conserved residues by (:). Mammalian L-threonine dehydrogenase is a nuclear encoded gene; the protein is synthesised in the cytoplasm and imported into mitochondria. The amino-terminal of the mature porcine L-threonine dehydrogenase protein isolated from mitochondria  corresponds to amino acid residue 51 on the porcine L-threonine dehydrogenase ORF (Fig. 4), which suggests that the pro-protein is cleaved to produce a 36 kDa mature enzyme. This value is close to that which would be expected since the mature porcine enzyme has a subunit molecular mass of 37 kDa on SDS-PAGE . The amino-terminal region of the mouse, fly and nematode L-threonine dehydrogenase proteins all have characteristics of mitochondrial targeting sequences (Fig. 5), despite being the region of lowest similarity within the protein, having a high content of basic amino acids and few acidic amino acids . Comparison of eukaryotic L-threonine dehydrogenase protein sequences. The L-threonine dehydrogenase sequences are: mouse, MmTDH; pig, SsTDH; Drosophila melanogaster, DmCG5955; Caenorhabditis elegans, CeF3.4 (corrected as described in results). NAD, indicates those conserved residues likely to contact the nicotinamide cofactor by homology with the crystal structure of the UDP-galactose 4-epimerases. The locations of the exon/exon boundaries are shown on the translated protein as underlined residues. A database search revealed the presence of L-threonine dehydrogenase genes in the genome of other organisms. The fly, Drosophila melanogaster has a 6 exon gene located on chromosome 3L which translates into a cDNA of 1288 bp, encoding the 367 residue CG5955 protein (accession No. AAF51607) (Fig. 5). The nematode, Caenorhabditis elegans has a 5-exon gene located on chromosome V (encompassing only the first 5 exons of the predicted 10 exons of the hypothetical gene product F08F3.4, accession No. AAB04871). By extending the fifth exon to the next polyadenylation site a 1217 bp cDNA is formed, encoding a 359-residue protein (Fig. 5). The cDNA sequences of both these genes are supported by EST data. The fly and nematode proteins have over 52% identity and 88% similarity to the mammalian proteins in the 306-residue, central core of the enzyme. Four exon/exon boundaries are conserved in two or more of the genes (Fig. 5). The search also revealed similar L-threonine dehydrogenase ESTs in amphibians, bony fishes, tunicates, flies, moths, mites, nematodes and trypanosomes, but not in higher plants and yeasts. Similarly, the gene for the second enzyme in this pathway, KBL, is also absent from the yeast, Saccharomyces cerevisiae , and no L-threonine dehydrogenase activity has been found in S. cerevisiae . That L-threonine dehydrogenase sequences have been evolutionarily conserved between the Gram+ bacteria and mammals is shown by the homology between mouse and the amino-terminus peptide sequence from the threonine dehydrogenase of the Gram+ Firmicutes bacteria, C. sticklandii which has 54% identity and 93% similarity over 28 residues  (Fig. 6). C. sticklandii is an amino acid fermenting anaerobic bacterium that can grow on threonine as a sole substrate. Together, the mouse and C. sticklandii sequences enabled the identification of putative L-threonine dehydrogenase genes in a number of bacterial species such as Thermoplasma acidophilum, T. volcanium and Staphylococcus epidermidis. 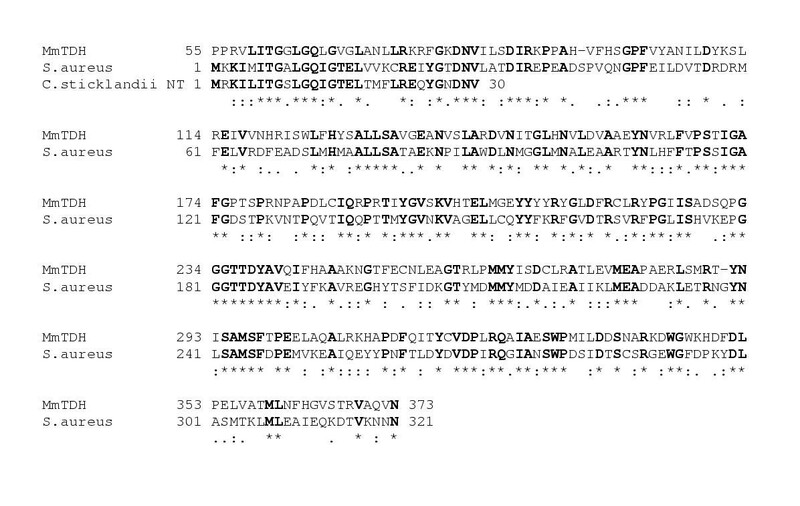 An alignment with the putative L-threonine dehydrogenase sequence, the SAV0542 gene, from S. aureus  that has 41% identity and 75% similarity to the mouse protein is shown in Fig. 6. Comparison of murine and prokaryotic L-threonine dehydrogenase protein sequences. The L-threonine dehydrogenase sequences are: mouse, MmTDH; Staphylococcus aureus hypothetical protein from gene SAV0542 (accession No. BAB46113) , S. aureus; Clostridium sticklandii threonine dehydrogenase amino-terminal peptide, C.sticklandii NT . A search of the protein structural database revealed that the closest matches with 19% identity were UDP-galactose 4-epimerases (GALE) from E. coli and Homo sapiens [20, 21]. GALE is a mixed alpha-helices/beta-sheet protein with a N-terminal NAD+ binding Rossmann-fold and belongs to the tyrosine-dependent oxidoreductase protein family (also known as short-chain dehydrogenases). The characteristic Tyr-X-X-X-Lys couple (residues 195 and 199) found in all family members are important for catalysis with the conserved tyrosine serving as the active-site base . By comparison with the crystal structures of the GALE proteins, two domains were identified and it is likely that the substrate, L-threonine, is located in the cleft between the two domains. The larger amino-terminus domain (residues 58–231 on the mouse sequence) has a NAD+ binding motif. There are 12 conserved residues in the murine L-threonine dehydrogenase protein that are likely to contact the nicotinamide cofactor (Gly-62, Gly-65, Gly-68, Asp-88, Ile-107, His-127, Leu-131, Asn-147, Ser-169, Tyr-195, Lys-199 and Tyr-222) (Fig. 5). The smaller carboxy-terminus domain (residues 232–335) has little similarity to GALE and is likely to be involved in substrate binding. To identify which tissues are likely to contribute to L-threonine dehydrogenase activity in the mouse, reverse-transcriptase real time PCR was used to examine the tissue distribution of L-threonine dehydrogenase mRNA. By reverse-transcriptase real time PCR L-threonine dehydrogenase expression was found in all tissues examined, being highest in liver, high in testis and spleen and lowest in skeletal muscle, relative to the expression of β-actin (Fig. 7A). Similar results were also obtained with another set of L-threonine dehydrogenase primers (located on exons 6 and 7) (data not shown). The expression of 2-amino-3-ketobutyrate coenzyme A ligase was also found in all tissues examined, being highest in liver and high in kidney. The expression level of the housekeeping gene β-actin was similar in all tissues examined. Another housekeeping gene, glyceraldehyde-3-phosphate dehydrogenase (G3PDH) was also used to standardise expression levels, but G3PDH expression showed greater variation between tissues, having higher expression in heart and skeletal muscle and lower expression in testis relative to β-actin (data not shown). After 40 cycles of PCR amplification, the amplicons were specific as verified by melting curve analysis (data not shown) and agarose gel electrophoresis (Fig. 7B). Expression of L-threonine dehydrogenase mRNA in tissues by semiquantitative PCR. (A) The expression level in each tissue cDNA was normalised to the expression level of the housekeeping gene β-actin. The ratio of L-threonine dehydrogenase mRNA to β-actin mRNA (Y axis, arbitrary units) from each tissue was standardised to that of liver, which was taken as 100. (B) Ethidium bromide stained agarose gel of PCR products after 40 cycles of amplification. Threonine dehydrogenase, TDH; 2-amino-3-ketobutyrate coenzyme A ligase, KBL. The tissues examined were: brain, Br; Heart, He; kidney, Ki; liver, Li; lung, Lu; skeletal muscle, SM; spleen, Sp; testis, Te; and no cDNA control, -c; 100 bp ladder, m.
L-threonine dehydrogenase is the first enzyme in the biochemical pathway converting L-threonine, via 2-amino-3-ketobutyrate, to glycine. In a search for mammalian L-threonine dehydrogenase genes, clones were isolated from mouse and pig with ORFs very similar to sequenced peptides from the pig L-threonine dehydrogenase protein . The mouse and pig L-threonine dehydrogenase proteins also have significant homology to amino-terminus peptide sequences from chicken (Gallus gallus) and the bacteria, C. sticklandii [15, 22]. I conclude that the cloned cDNAs encode L-threonine dehydrogenase genes. The mammalian proteins belong to the tyrosine-dependent oxidoreductase protein family (also known as short-chain dehydrogenases). They do not have any significant homology to the well-characterised bacterial L-threonine dehydrogenase enzymes from E. coli and the Gram-negative plant pathogenic bacteria Xanthomonas campestris [13, 23, 24], which belong to the medium-chain, zinc-binding alcohol/polyol dehydrogenase family. However, they are distantly related with both short and long-chain dehydrogenases having characteristics of the NAD(P)-binding Rossmann-fold. Both short- and long-chain L-threonine dehydrogenases have no significant homology to the D-threonine dehydrogenase gene from Pseudomonas cruciviae  that is a member of the 6-phosphogluconate dehydrogenase family. However, both types of L-threonine dehydrogenase utilise NAD+ as a co-factor, but the C. sticklandii enzyme only utilises NAD+ as an electron acceptor whereas the E. coli enzyme also catalyses the reduction of 3-acetylpyridine adenine dinucleotide and thionicotinamide adenine dinucleotide [13, 15]. In L-threonine dehydrogenases purified from vertebrate livers NAD+ is the lead substrate followed by L-threonine and the products are released in the order CO2, aminoacetone and NADH [5, 10]. All these reaction products inhibit threonine dehydrogenase activity. The short-chain and medium-chain threonine dehydrogenase also differ in their requirement for zinc ions with the E. coli enzyme requiring one ion per subunit and the C. sticklandii enzyme being inhibited by zinc ions [13, 15]. Their substrate specificity differs since the E. coli enzyme will also oxidizes L-serine in addition to L-threonine [8, 15]. In the mouse, expression of both threonine dehydrogenase and 2-amino-3-ketobutyrate coenzyme A ligase mRNAs were found in all tissues examined, both being highest in liver. In vertebrates, threonine dehydrogenase enzymatic activity is thought to be mostly confined to the liver when the mass of the organ is taken into consideration. In the rat, the activity in kidney and heart was 30% and in brain 10% of the hepatic activity: no activity was detected in other tissues . In the pig, activity in the pancreas was similar to that of liver, but no activity was found in other tissues . The mRNA data supports the suggestion  that this pathway has a wider tissue distribution than had been thought previously. In vertebrates, L-threonine is degraded by two major enzymatic pathways. In normally-fed pigs and rats 80 to 87% of L-threonine catabolism occurs via threonine dehydrogenase [6, 27]. Probably, the 2 major pathways have different physiological roles with the cytosolic L-serine/threonine dehydratase enzyme  being highly inducible by a high protein diet, starvation and cortisone, and thought to aid the homoeostatis of blood glucose by mobilising threonine and serine for hepatic gluconeogenesis. Whereas the mitochondrial threonine dehydrogenase enzyme is thought to act in the maintenance of free somatic threonine concentration derived from dietary threonine . With the identification of threonine dehydrogenase and L-serine/threonine dehydratase  genes from rodents, the way is open to study their relative contribution to threonine catabolism under different physiological states. The mouse and pig L-threonine 3-dehydrogenase cDNAs have been cloned. They encode 373 residue proteins. The mouse gene is located on chromosome 14, band C. Mammalian L-threonine 3-dehydrogenases are mitochondrial enzymes that utilise NAD+. In agreement with this, the predicted proteins have mitochondrial targeting sequences in their amino-termini followed by an NAD+ binding domain. In murine tissues, the expression of L-threonine dehydrogenase mRNA was highest in the liver. Clones encoding the mouse L-threonine dehydrogenase cDNA sequence were obtained by touchdown PCR amplification from mouse liver and lung cDNAs using the Advantage cDNA polymerase mix (Clontech, UK) on a Perkin-Elmer 2400 thermocycler. The cycle conditions for the first 10 cycles were 94°C for 5 sec, 72°C less 0.4°C per cycle for 3 min and for the next 20 cycles 94°C for 5 sec, 68°C for 10 sec, 72°C for 3 min per cycle using primers (100 nM) derived from the sequence of the mouse ESTs D21787, forward 5'-CCGGCTCCCGCGTGGCGTTCTCAGCATCCA-3' and AV100443, first reverse 5' TTTTTTTTTTTTTTTTTGATACTTAAATTG-3' and second reverse 5'-TTTTTTTTTTTGCAAGCGATCGTT-3' (Amersham-Pharmacia Biotech, UK). The porcine (Sus scrofa) L-threonine dehydrogenase cDNA was cloned from primary hepatocytes  (generously provided by Dr Leonard J. Nelson, Liver Cell Biology Laboratory, University of Edinburgh, UK). Total RNA was extracted using guanidine thiocyanate and treated with DNase-I to remove any contaminating genomic DNA (SV total RNA isolation system, Promega, UK). A comparison of the murine threonine dehydrogenase cDNA sequence with the pig EST database identified similar 5' and 3' ESTs (accession Nos. BE233801 and BI400146 respectively). 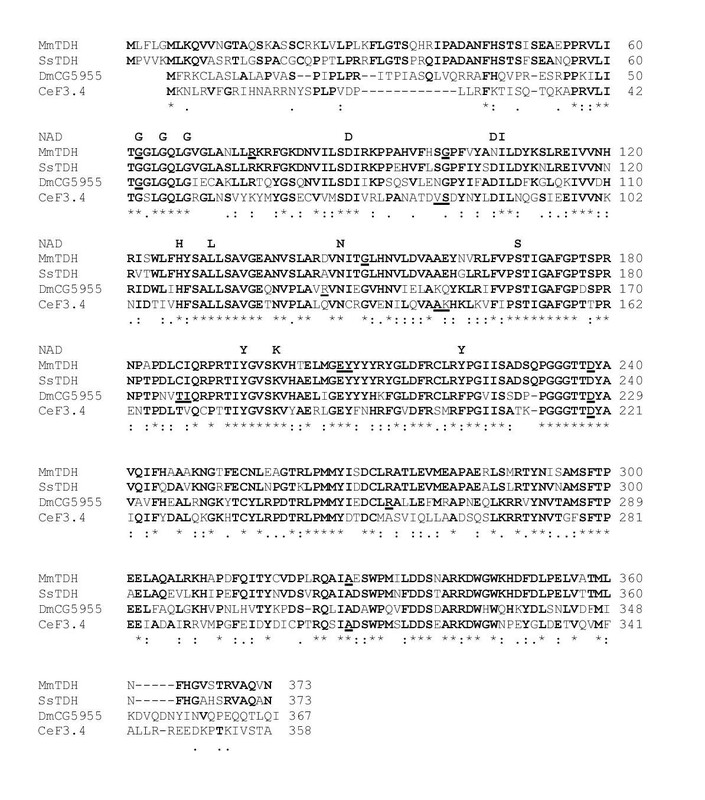 From these EST sequences a gene-specific reverse transcriptase primer and PCR primers were designed to amplify a cDNA region encompassing the porcine L-threonine dehydrogenase ORF. Total RNA was reversed transcribed with AMV RNase H- reverse transcriptase (ThermoScript, Life Technologies, UK) at 50°C using primer 5'-GTTTAATACAAATGTCACATACTTCCACAT-3'. The cDNA was amplified by touchdown PCR, as described above, with a final annealing temperature of 58°C using the PCR primers 5'-GGAAGGCTGTTGGCAGAGACC-3' and 5'-CGCTTCCTCCGGCACTTCA-3'. PCR products were examined by agarose gel electrophoresis and stained with ethidium bromide. For cloning, PCR products were excised from low-melting point agarose gels and the agarose digested with agarase (Promega, U.K.). The PCR products were cloned into the T-A vector pCR-II-TOPO (Invitrogen, The Netherlands) and sequenced in both directions using the big dye terminator cycle sequencing ready reaction kit and AmpliTaq DNA polymerase FS and run on an ABI 373XL Stretch Sequencer (both from PE Applied Biosystems, UK). Murine cDNA from 8 tissues (BD Clontech, UK) was analysed for the relative expression of L-threonine dehydrogenase and the housekeeping gene, β-actin, by real time PCR. This was carried out on a GeneAmp 5700 Sequence Detection System using a SYBR Green I double-stranded DNA binding dye assay (both from AB Applied Biosystems). Approximately 0.4 μg of cDNA from each tissue was amplified by PCR using Taq Gold polymerase. Tissue master mixes were divided into gene specific mixes with the addition of PCR primers to a final concentration of 300 μM. The L-threonine dehydrogenase primers were; sense 5'-AAGCACGCGCCTGACTTC-3' and antisense 5'-CCGAGCATTGCTGTCATCTAGA-3' and produced a 99 bp amplicon. The 2-amino-3-ketobutyrate coenzyme A ligase primers were; sense 5'-TGCACGGTTGTCTTCTCAAATG-3' and antisense 5'-ACACAGCGGTCAATGTCTTCCT-3' and produced a 150 bp amplicon. The β-actin primers were; sense 5'-CAGAAGGAGATTACTGCTCTGGCT-3' and antisense 5'-GGAGCCACCGATCCACACA-3' and produced a 93 bp amplicon. The PCR primers were designed (with the aid of the Primer Express program, AB Applied Biosystems) to amplify cDNA with both sense primers located on the penultimate exon and the antisense primers located on the last exon. The β-actin primers were designed to amplify β-actin specifically and not other actin isoforms or pseudogenes. The amplification conditions were; a 10 min hot start to activate the polymerase followed by 40 cycles of 95°C for 15 sec and 60°C for 1 min. The number of cycles required for the SYBR Green I dye fluorescence to become significantly higher than background fluorescence (termed cycle threshold [Ct]) was used as a measure of abundance. A comparative Ct method was used to determine L-threonine dehydrogenase gene expression. 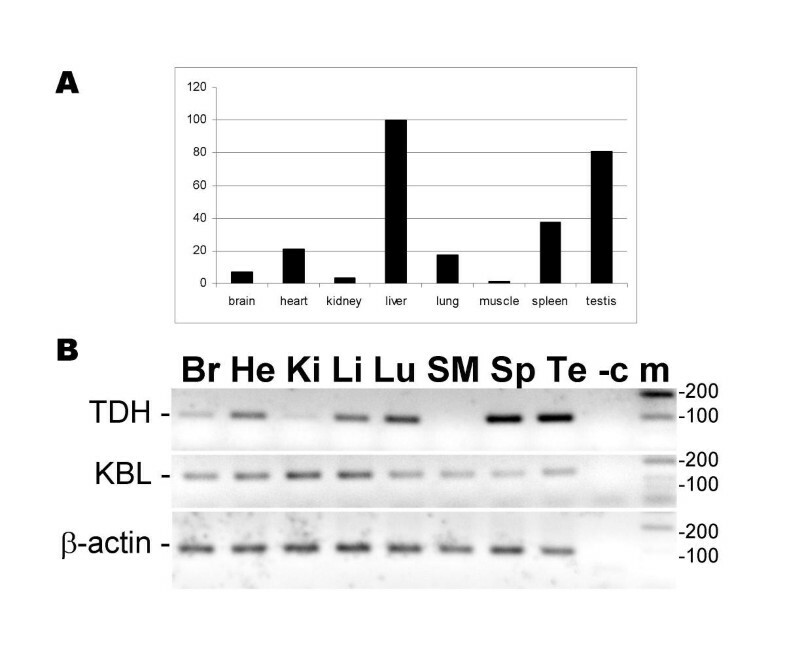 Expression levels of L-threonine dehydrogenase in each tissue cDNA sample was normalised to the expression levels of the housekeeping gene β-actin (ΔCt). The ratios of L-threonine dehydrogenase mRNA/β-actin mRNA from each tissue were standardised to that of liver which was taken as 100% (ΔΔCt). The formula 2-ΔΔCt was used to calculate relative expression levels assuming a doubling of the DNA template per PCR cycle. To confirm amplification specificity, the PCR products from each sample were examined by melting curve analysis and subsequent agarose gel electrophoresis. I thank the Advanced Biotechnology Centre, Charing Cross Campus, Imperial College for DNA sequencing, and Drs Chris Murphy and Nadire Ali for their constructive comments on this paper.